“artificial additives, artificial colours, artificial flavours, GM” – that sounds a bit too honest. I wonder if these non-green claims exactly cancel out their green claims, meaning that they are neither good nor bad for the environment. Then, “Legendary Customer Service” – really? The top image is the site between Jan and May 2000, and the bottom one thereafter. 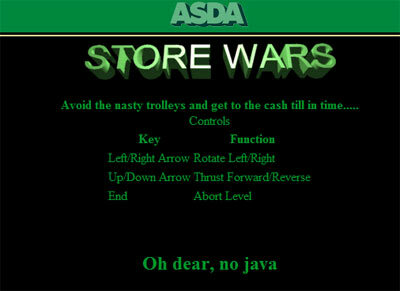 Although the text has changed, the links are more or less the same apart from one – “Off your trolley”, which didn’t last long for some reason. Could Iceland have made a trolley-based game which is even better? This entry was posted on August 24, 2010 at 11:02 am	and is filed under Iceland. You can follow any responses to this entry through the RSS 2.0 feed. You can leave a response, or trackback from your own site. I remember the Store Wars game. At the time Supermarket Sweep was hugely popular with students and I remember playing this game in the course of compiling a Dale Winton-based page, which I constructed as part of an elaborate practical joke too unfunny to go into here. I remember the game being relatively good, actually. Never played the Iceland one though.